Come help the Stanley Park Ecology Society remove salal from Beaver Lake bog! 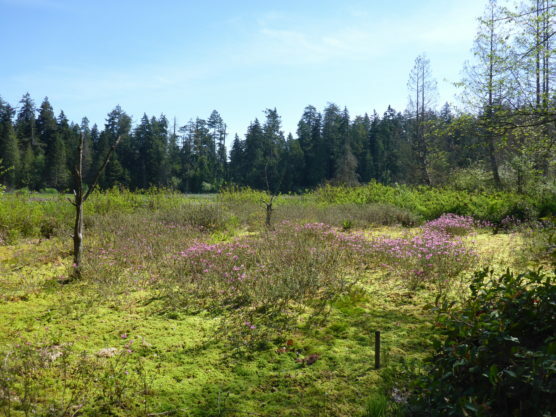 Restoration of the Beaver Lake bog by SPES, with the hands-on support of the Camosun Bog Restoration Group, has been underway since 2011. The next step in this project is the removal of this large patch of salal, the removed salal will be transplanted the next day to an area where invasive plant species have been removed. Volunteers should arrive dressed for the weather with rubber boots, and be prepared to work on uneven, muddy terrain and possibly wear waders (which SPES will provide). Please meet at the Stanley Park Pavilion. If you would like to be put on the waitlist for the April 7th event, please fill out the form below and indicate in the “your message” box.